Sears Crosstown shut down piece by piece — first the Sears retail store and eventually the catalog fulfillment center, closing its doors for good in 1993. While the building became more derelict and dangerous, neighbors were told that even the effort of imploding it was prohibitively expensive. The abandoned colossus — encompassing as many square feet as the Empire State Building — loomed silently over Midtown Memphis for 17 years. Proximity to Sears Crosstown was considered a real estate liability. It was hard to imagine how that would ever change. First the Sears retail store and eventually the catalog fulfillment center, the mammoth Sears Building has been reinvented as the breathtaking Crosstown Concourse. It’s hard for a camera to even convey the enormity of this building, which encompasses as many square feet as the Empire State Building. Of course, when imagining is really hard to do, it’s best to leave it to professionals. It was art history professor Dr. Todd Richardson and artist Chris Miner who envisioned a future for Crosstown far beyond conventional development models. When Southeastern Asset Management CIO and Poplar Foundation director Staley Cates took ownership of the building in 2007, Richardson and Miner were asked for their input. Despite being in the midst of a deep recession, progress started to happen. Richardson and Miner cofounded Crosstown Arts in 2010 and began hosting events like MemFeast that brought activity into the building for the first time in 17 years. People were immediately drawn to the space. As thoughts of development built, a direction began to crystallize. This is the entrance to the central atrium of the Crosstown Concourse. Banners emblazoned with the Crosstown Concourse signature colors and logo proudly announce the new development. This forward-thinking development is both sleek and modern with the timeworn patina of its storied past. The community library is on the second floor overlooking the central atrium. Businesses can have lunch-and-learns or simply socialize on this public amphitheater-style gathering area. That vision took shape as a vertical urban village anchored in arts, education and healthcare. Major local institutions joined the effort as founding tenants, including St. Jude Children’s Research Hospital, Church Health, Memphis Teacher Residency and Methodist Le Bonheur Healthcare. The planning team’s goal was to go beyond mixed use — to put people and partners not just near each other, but in connection with each other. As demolition inside the building began in 2014, conversations continued on Crosstown’s direction. Along with the large organizations planning a presence, the building would include residential, retail, dining, educational and arts spaces, but with a development twist. Natural light floods the enormous and refreshingly airy space. The west atrium houses Church Health, among other dynamic businesses. A colorful wall leading to the Crosstown YMCA‘s reception desk reminds one of holistic health. This is a Tower Garden for the Church Health Teaching Kitchen and Juice Plus partnership. To facilitate these conversations, the Crosstown team created a “Better Together” department that helps current and potential tenants see the possibilities of collaboration. Redubbed Crosstown Concourse, the renovation first began to be revealed in early 2017. Although some tenants were relocated and operating in those first months, most Memphians still did not realize they could step inside until the grand opening in August, 87 years to the day of Sears’ original ribbon-cutting. But when they did, the response was overwhelming. Thousands turned out to get a look at the transformation of the 10-story, 1-million-square-foot former ruin. The Claybrook Pass entrance announces all of the business you can expect to encounter in the long corridor. This patio on the north side of the building overlooks the construction of the soon-to-be Crosstown Theater. This “Stargazer Garden” is an interactive work of art created by participating guests. The original vision for Crosstown took shape inside the building in ways even the planning team had not imagined. There were 41 office and retail tenants with 700+ employees and more than 200 residents in the Concourse at the grand opening, and even more have been added and are on the horizon. Once the building reaches full occupancy, it is expected to welcome 3,000 people each day. The concept of a vertical urban village has truly become a reality. A Parcels apartment-dweller can step into Crosstown Concourse’s central atrium to get a morning pick-me-up at French Truck Coffee or I Love Juice Bar before a workout at Crosstown’s YMCA, operated in partnership with Church Health (which alone occupies 150,000 square feet over three floors). Then she might go to work at one of the building’s 23 office tenants like NexAir, Christian Brothers University, A Step Ahead Foundation or Temple Israel, or stick around for an exam at FocalPoint or Tanenbaum Dermatology Center, then pick up a prescription at Madison Pharmacy. Maybe a local entrepreneur will have a big lunch meeting at Next Door American Eatery, Farm Burger or Mama Gaia, or celebrate a success at Area 51 Ice Cream (soon that can happen at Crosstown Brewing Co., too). After a full day, Crosstowners can get ready for a night out at Gloss Nail Bar and Cheryl Pesce: The Lifestyle Store, or pick up supplies at The Curb Market for an evening in — including a quick stop at So Nuts & Confections or MemPops to stock up on late-night snacks. And if they want to spend a few nights without signing a lease, travelers can enjoy a stay at Layover. Guests dine at Farm Burger. 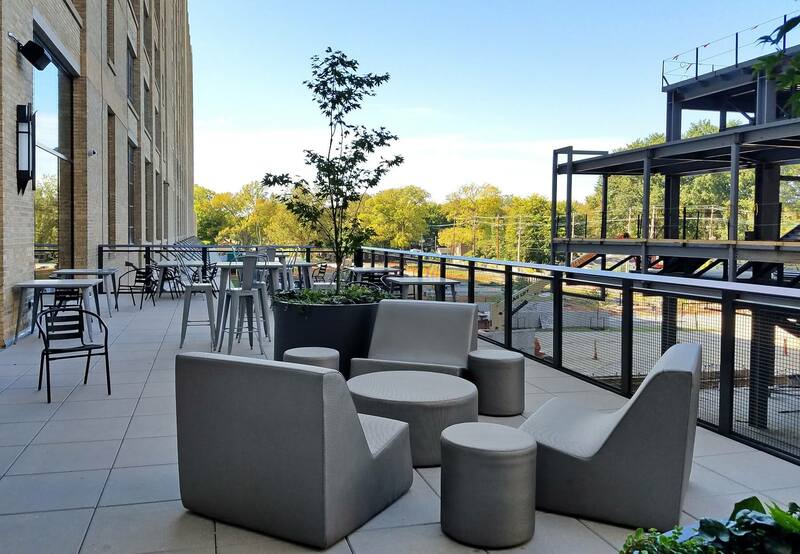 Enjoy an al fresco afternoon bite on the patio at Next Door American Eatery. In keeping with the healthy theme of Crosstown, I Love Juice Bar is a proud tenant of the development. This is the destined-to-be-iconic, curving stairwell leading to Crosstown Arts‘ new space in the Crosstown Concourse. 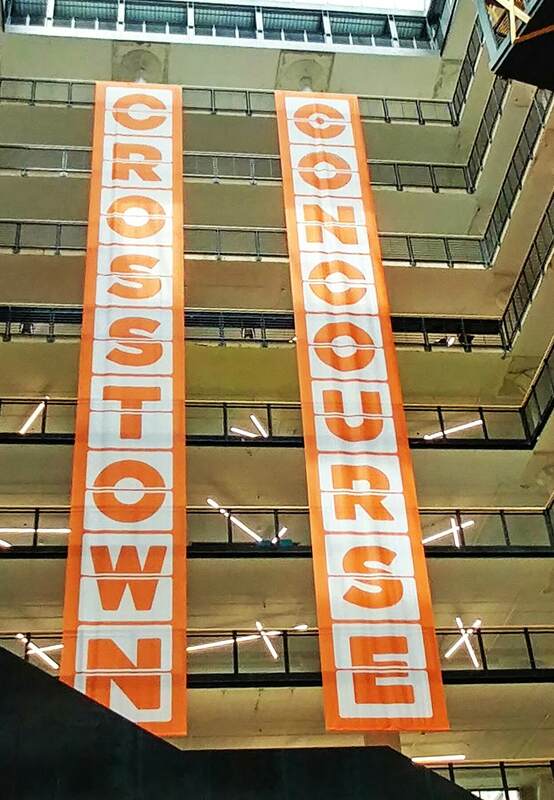 The originator of Crosstown Concourse will be one of the last round of initial tenants to move in: Dr. Richardson’s Crosstown Arts will expand from its 400-square-foot space on Cleveland Avenue into a much larger space with a wider array of ventures. The organization will help program the 450-seat Crosstown Theater, scheduled to open next November; partner with Crosstown High School, which welcomes its first class in August 2018; and continue developing creative new ways for the community to connect through the arts. Crosstown Concourse is located at 1350 Concourse Ave., Memphis, TN 38104. To learn more, call (901) 203-8300 or visit crosstownconcourse.com.